You can welcome me back. I have lost my way on my blog because I was unsure about what I wanted to do with it. After countless conversations with friends and hearing how they view their personal blogs- it made me think about how I feel about my blog. What do I want this blog to be?? I am no expert in teaching English, nor am I really knowledgeable about South Korea or even Daegu. With those in mind, I have decided to just put my experiences on here for me and anyone who might care back home. This blog will be so special for me to look back on, so I must take care of it! This day marked the beginning of our long weekend and Erin and I were not about to pass up the opportunity to go to a festival in our city! 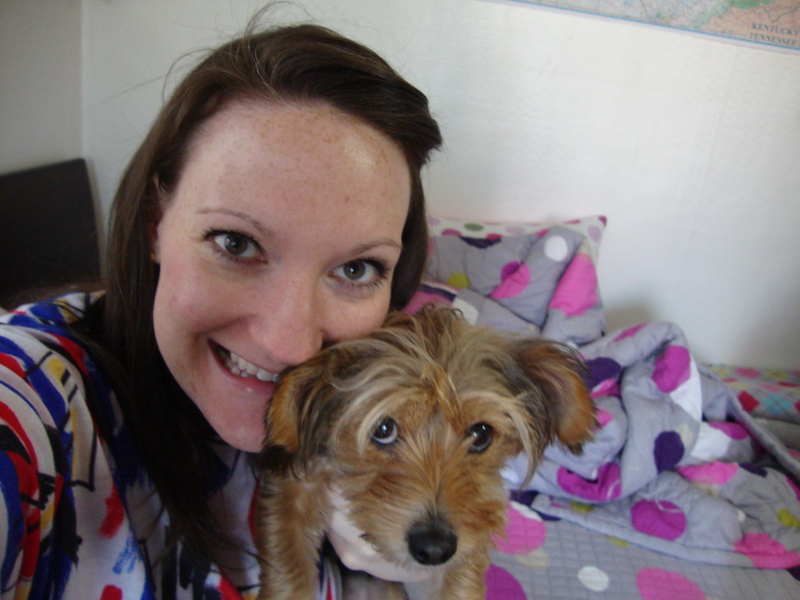 Erin had the great pleasure of dog sitting Kiyomi, (our friend Kristen’s dog) for the whole weekend. 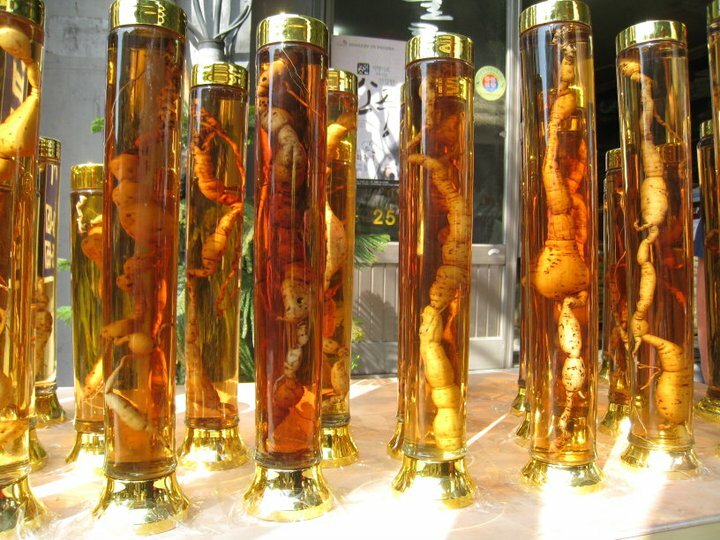 Wandering around the streets of the actual Oriental Medicine Street in downtown Daegu everyone was sure to put out their very best and most creepy looking ginseng. Mysterious Herbal Plant Tunnel...we weren't sure what to expect! 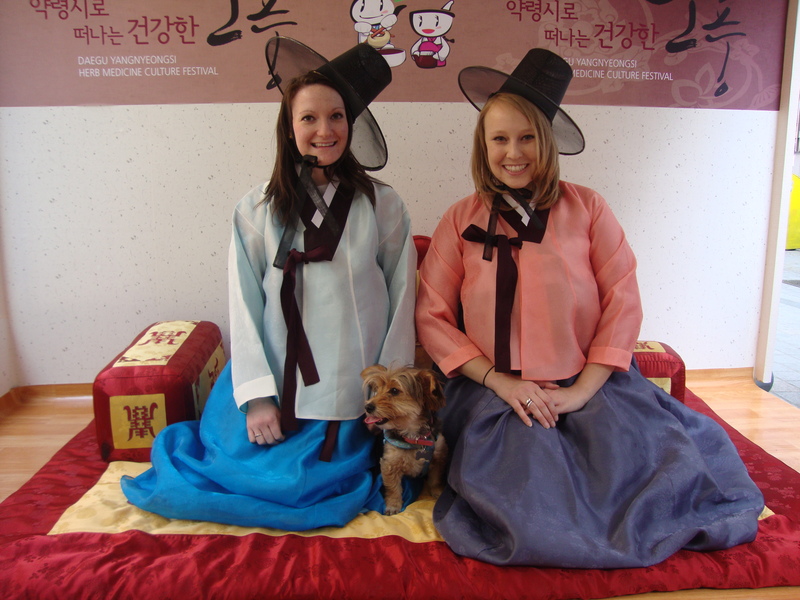 Kyomi, Erin and I all dressed in traditional clothing! At the end of the festival we witnessed the strangest and possibly drunkest mascot we’ve ever seen. We saw him walk into the street and almost get hit by a car and then a stranger was trying to push him into the fountain!! 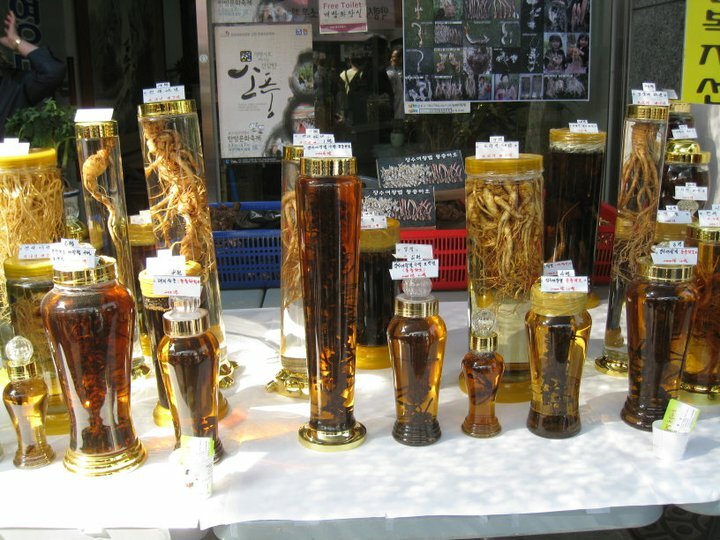 Daegu Oriental Medicine Festival 2011 Mascot. Korea loves mascots. 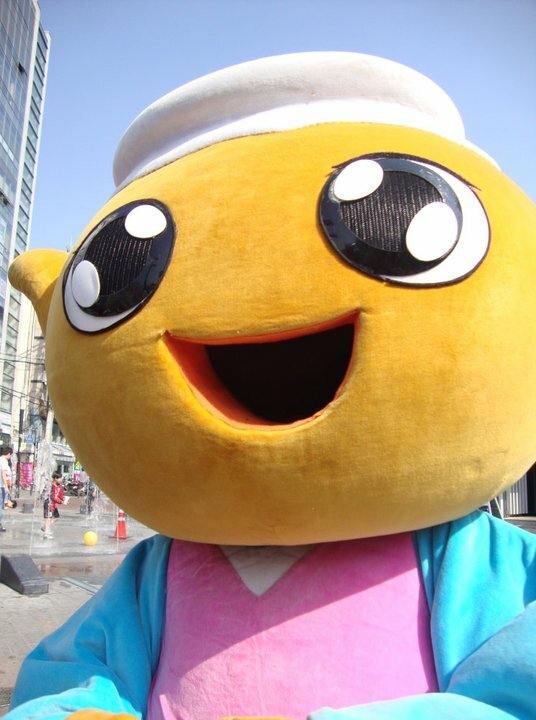 Every festival, even city in Korea has a mascot. I am not sure how these mascots are decided but I admire these people who dress up the costumes for each festival! I love Kiyomi!!!!!!!!!! Look at her!!! I am sorry to Kristen because I feel sooo creepy. This was all in one day! Remember, that I had a 4 day weekend. We had to go to school the next day (May6th) but then Saturday-Tuesday we had off as well. My weekend started—back at school. Sports Day! It was the first really humid day of the year so far. Sports day could be compared to field day in the USA…but way more extravagant. Every class of students from 1st-6th performed a choreographed dance and participated in relay races. There relay races for the students, parents, grandparents and teachers! The day went off without a hitch. There was a strict schedule and everyone was on time, there were even announcers to keep everyone on track. Spirits were high in Nambu : ) I, of course, had no real role in the day so I just wandered around cheering and taking pictures.